Thank you for taking the time to visit Funtastix.com! We’ve been serving the Delaware, Pennsylvania and Maryland area for over 18 years. Here you’ll find the best selection in event and party rental equipment in the tri-state area. Awesome water slides, bounce houses, amusement rides, obstacle courses and concessions are just a click away. We’ve made making your rental reservation a snap; or should we say a click? You can start a reservation anytime by clicking the “Book Online” button above, and select your dates and time. Or you can browse through our inventory for just the right item and click the “Add to Cart” button. Either way, we’re ready when you are, because the “Fun Starts Here”! The All Star Arena is Ready to Rock! 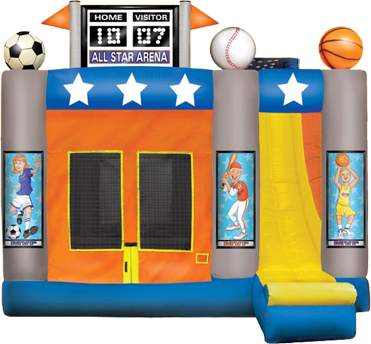 At 140 square feet, the All Star Arena bouncing area is much larger than other combo units. It also includes a Basketball Hoop inside to give the kids another fun activity to do. Top that off with 13' slide with a 50 degree sliding angle (even the 13 year olds will have fun) and you've got yourself a sure winner! There’s a completely enclosed sun-screened mesh cage over the entire top and sides of the slide. In addition, this combo was designed so that kids cannot stand up and jump off at the top of the slide preventing any unnecessary accidents. With our front loading Slide, you can supervise the entire ride from the front of the unit. All this in a 15' x 15' footprint. 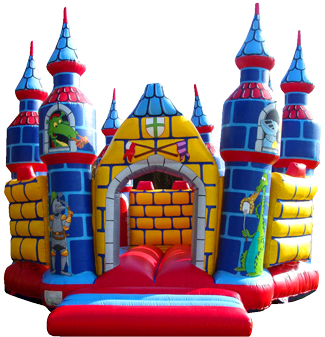 Our Dragon's Watch is an authentic bouncy castle imported from England. At nearly 3 stories high, this impressive Moon Bounce is the ultimate inflatable bounce house. The extra high floor makes the Dragon's Watch "bouncier" and more fun. This is an inflatable of exceptional high quality that will provide the most fun you could ever have in a Moon Bounce! Not your ordinary photo booth! 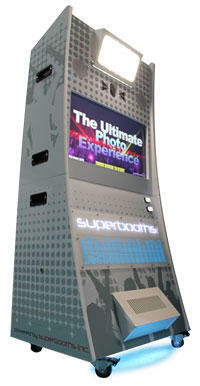 No this is not your ordinary photo booth... Our Super Booth is the world's first interactive photo shoot experience. A fresh, exciting product delivering fun and laughter across the globe. Super Booth will go above and beyond meeting all of your event and/or branding needs. Our virtual photographers and "photo-tainment " format combines music, lighting and photography into one awesome product. 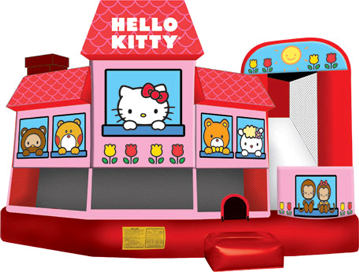 If you really want the absolute best bounce house combo for your princess's party, this is it. 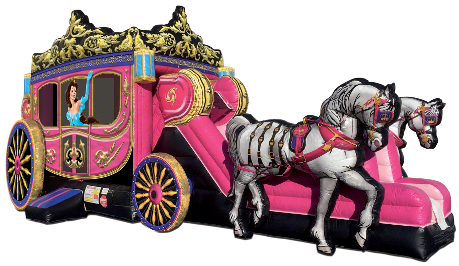 This is a premium inflatable that's perfect for backyard birthday parties, first communions and other special occasions. Featuring UV coated digitally printed original artwork, kids just love this jumper. Wouldn't this look awesome at your next party? This combo features a bouncing area, climb & slide, amazingly-detailed digital graphics, a crawl-through, and FingerSafe™ netting on the large vent windows. Parents can keep a watchful eye on activity inside and your Princess will have the time of her life! For more information or to reserve this for your next party, click here! Call 302.661.1386 for reservation details.